“Size doesn’t matter” on the Toy Ride – everyone’s welcome! A reception was held October 23 at ‘Warm Up’ on Nimmanhaemindha Road to launch the 2nd Annual Toy Ride 2009 which is due to take place on January 4. During the event, the organisers took the opportunity to thank the sponsors of the 1st Annual Toy Ride, including Harley Davidson (Bangkok), Tesco Lotus and BMW Discovery Tours for their much appreciated support. To start the ball rolling, donations of 5,000 baht were received at the reception from Richco Motor Sports, GT Rider and E-Insurance Thailand. Over 200 motorbikes, ranging from the ubiquitous Honda Dream right up to the superb Harley Davidson, took part in the first Toy Ride, which raised over 250,000 baht. The organisers of the rally do not give cash donations, but use the money to buy toys, blankets and other necessities for their selected charities and children. The first Toy Ride’s recipients included Vienping Orphanage, Suan Dok Hospital and children from rural villages in the Samoeng area. Surprisingly, after having delivered toys to children at Suan Dok Hospital, the organisers received an emergency phone call asking for colostomy bags as the hospital had run out and was having to reuse old ones. Hearing this and happy to help, the Toy Ride donated 40 bags. January 4’s Toy Ride will be a short one, and will include two circuits of Chiang Mai plus a scenic route to Mae Rim, the reason being that the organisers would like more ‘small bikes’ to take part. Bikers – just turn up with a full tank, and a toy! There are also plans for rides to take place every 3 or 4 months throughout the year, the first of which will be on November 16 this year and will trace a route from Chiang Mai to Chiang Dao. For further details, or to make a donation, please visit the Toy Ride’s website www.chiangmaitoyride.com. The Annual Amari Wedding Fair 2008 began with what was planned as a spectacular gala opening on Friday 24, with the event extending over the weekend. The two live mannequins posing above the swimming pool. The swimming pool had been transformed during the day with columns of flowers, candles floating in the pool itself, and subtle yet effective lighting. Three bars, six food stations, tables and ice carvings of love hearts and champagne glasses – everything needed to produce the ‘perfect wedding setting’ – had been arranged, ready for the more than 100 invited guests, including local media, due to arrive at 6 p.m. Two live mannequins had been posed on platforms above the swimming pool, dressed in a mix of Edwardian costume and traditional Thai silk. Unexpectedly, an hour into the festivities, the wind roared and the heavens opened! With torrential rain soaking the scene and guests running for cover, the Amari’s staff took just 10 minutes to clear the adjacent Lanna Restaurant and reset the event under cover. Well done, guys, even if one guest was overheard to mention the Titanic! Disaster averted, the band played on, the food was of the Amari’s usual high standard, and everyone enjoyed themselves until the storm subsided and the opening (again outdoors) could take place. A fashion show, featuring beautiful brides and handsome grooms dressed in wedding finery, followed, and Payap’s Ajarn Tae’s band played on until the very end, accompanying the guests as they mingled, gossiped and networked. All agreed that full credit was due to the staff of the ever-popular hotel, and to its executive assistant manager, Waranee Khammeru, for the way in which they dealt with the drama! For further details of Weddings at the Amari Rincome, please call 053-221-130. Nakornpayap International School (NIS) will open its doors to the entire community on Saturday November 22, when it will hold a charity boot sale. It’s a great chance to sort out all those clothes, books, CDs and bits and pieces which invariably lurk in Chiang Mai cupboards, and bring them along so that others can get a chance to use them – and benefit the charity as well! In addition to any members of the community who would like to participate, a number of non-profit charity organizations will have booths at the sale. There will also be a play area for children and a seating area. 60 spaces are available, costing 200 baht each, and reservations can be made now by calling Melanie on 084-485-5986 (English speakers), Tae on 085-100-1770 (Thai) or the school’s office on 053-110-680 ext 101. The event is being organized by one of NIS’ community service clubs, which is linked with the Care for Dogs Temple Aid Program. In many temples, the resident dogs are not given priority. Any food they are given tends to be just leftovers, and medical care is almost nonexistent. Students at NIS decided to address this problem by forming a Temple Aid Program in conjunction with Care for Dogs, a local community organization which shares the same goals. This community service club is the first of its kind, started by students who felt that this was an important issue to which they could dedicate themselves. In August of 2007, NIS students made their first visit to Wat Nongpakrung, a local temple which is home to about 25 dogs, and found their work cut out for them. Funds were desperately needed to feed and provide medical care for the dogs on a consistent basis. They didn’t give up – they’ve been providing ever since! Each week, a bus full of students visits the temple, provides food and checks up on the dogs. There’s always a new challenge, either a new dog has just been dumped, or a beloved one has fallen sick. The kids take it all in their stride, and the dogs love their human friends. Back in August, on the occasion of the Amari Rincome dinner held to choose the three beneficiaries of the 2009 Rooftop Charity Party, it was announced that, due to the generosity of a donor, each runner-up would receive the sum of 30,000 baht to be spent on necessities for their charity. 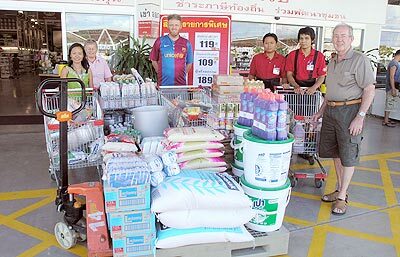 Glenn Croston of Lamphun’s Croston House orphanage, having just returned from his fund-raising walk, chose last week to spend his 30,000 at the Makro supermarket to the benefit of the children he and his wife care for. He thanked the organisers of the Rooftop Party and the donor for their generosity and help, and said he will be writing officially very soon. We’re sure the kids enjoyed the goodies and special treats which must have been part of his choice! the 30,000 baht donation at Makro. The United States, reeling in both foreign and domestic political turmoil and in the worst economic downfall since the Great Depression, seems desperate for change. After eight years of governance by Republican George W. Bush, a president with one of the lowest national approval ratings in history, Democrats have been particularly eager for what Barack Obama has termed, “the change we need.” This desire for change has been echoed and affirmed by national polling data. The above has, no doubt, been taken to heart by Chiang Mai Democrats Abroad, considering that there are approximately 6 million Americans living overseas. The group has hosted three well attended screenings of each of the Presidential and Vice Presidential debates at various locations in and around town, has raised money for the Obama campaign, and has helped citizens with their absentee votes. Jennifer Crist, Chiang Mai Democrats Abroad member, says that she has “…never before felt so impassioned about voting in the Presidential election.” Crist, who wields a politically valuable Florida vote, is one of the many Americans who have participated in an unprecedented number of early and absentee votes this year. Gallup, the most prominent polling organization in the US, reported that, by October 26, 17% of registered voters had already voted. It also reported that, at that point, Barack Obama led John McCain in likely voter estimates 50% to 45% using the traditional model, and a slightly larger lead with 52% to 43% in the expanded model. The majority of Chiang Mai’s Americans abroad will probably know who will be the successor to George W. Bush by the morning (however early) of Wednesday, November 5, the day after US Election Day. If Obama has won, there will be a celebratory bash open to the public at the UN Irish Pub from 7 p.m. to 9 p.m. Wednesday night. Next Saturday, November 8, the Healing Family Foundation will hold its Three Year Anniversary Event at Rajamangala University of Technology (Lanna) on Huay Kaew Road. The celebrations will run from 9 a.m. until 12 noon. The event promises to be a fun-filled morning, with blue elephants, ‘mummy men,’ ‘Dragon & Beauty’ and much more to enjoy! The Healing Family Foundation, located at Baan Sanook, 2, Nawarket Road, close to Narawat Bridge, operates a workshop mainly for disabled children in Chiang Mai. It was formed by a group of parents in 2005, providing a space for people with disabilities to enjoy themselves. Many of the children and young adults have become experts in weaving on a specially adapted loom, and their crafts will be displayed and for sale at the 3rd Anniversary Event. For more information, please telephone 053-244-393. The considerably stylish @Living Room Bar is putting on a night of true drinking indulgence to mark the occasion of its first year anniversary. As part of the celebrations they’re inviting people to come along and sample a range of free delectable cocktails to help them update their cocktail menu. Connoisseur status isn’t mandatory just come along, drink and vote on your favourites. The theme for the party is ‘Masquerade’ and there’ll be prizes for party goers turning up in the most creative outfits. They’re also looking for five volunteers for a special competition inviting people to create their own cocktails. If you’re new to mixing, shaking and stirring, their experienced bartender will walk you through the basics and then you’ll be let loose on the bar, free to come up with your own concoctions. They’ll be prizes for the winners as well as the winning tipple becoming a regular feature on the @Living Room Bar menu. The first five volunteers to email [email protected] .com will qualify for the competition. Although having aged gracefully over the year, the bar itself has also been through a bit of a facelift. There are some recent modifications to the interior, with new games and new scenery as well as some new faces behind the bar to leave you feeling totally indulged. This decidedly unmissable celebration will take place on Friday 7, from 9.30 p.m., with music, DJs, prizes and the chance to find out that your best friend (or your worst enemy, last year’s boy-friend, etc!) is lurking behind that totally over-the-top mask! @Living Room bar is situated at Somphet Gold Place, on Chaiyaphum Road, opposite Somphet Market. As if anyone could possibly miss Loy Krathong in Chiang Mai – it’s happening everywhere! Here are some of the highlights of the planned events. November 8 at Mae Jo University, there will be a Buddhist ceremony and traditional dances, after which 5,000+ khom loys will be released by the crowds of people into the early evening skies. A sight never to be forgotten! The ceremonies should begin late in the afternoon. Everyone is being advised to allow plenty of time to get there. November 10 The Grand Opening of Loy Krathong will take place at the Three Kings Monument at 6 p.m., followed by traditional and cultural stage shows and beauty contests. November 11 through 13 will see 3 parades. On November 11, the ‘Local Lanterns Parade and Contest’ will take place and November 12 will see the ‘Small Krathong Parade.’ The grand finale, the ‘Giant Krathong Parade,’ happens on November 13. All parades will start from Thapae Gate at around 6 p.m. and continue down Thapae Road and along the river past the Municipal Buildings. Each parade will last approximately 3-4 hours. Drivers should avoid all surrounding areas from 3 p.m. onwards. Also on November 12 and 13, during the evenings, there will be fireworks displays along the river in front of the Municipal Building. Last week, the Holiday Inn held a special ‘Wine Dinner’ on its River Terrace, serving Monsoon Valley Wine, a Thai wine from Siam Winery. We’ve all heard, at dinner or in conversation, remarks about Thai wines in general which didn’t exactly encourage consumption. Most of us know now from experience that Thai wines, particularly from this company, are good value and good quality! Francois, Simon, Kim, Rudy and Luca (l/r) at the Holiday Inn’s River Terrace toasting the success of Monsoon Valley Wines. On this particular evening, the three wines on offer were Monsoon Red, Shiraz, Monsoon White (a mix of Malaga Blanc and Colombard) and the ever-popular Rose, a White Shiraz. On hand to give expert advice was Kim Wachtveitl, Siam Winery’s director of business development, together with the team from Horeca, the company’s major suppliers to Chiang Mai. To go with the wines, the Holiday Inn’s chef provided delicious finger food, including spring rolls, beef satay and cheese desserts. The service, of course, was at its usual impeccable level. Many of the guests commented on the quality of the wine, and were happy that it has improved so much that it is now available in many top-class Chiang Mai hotels and restaurants. A very pleasant evening for all the guests – and it didn’t rain once!